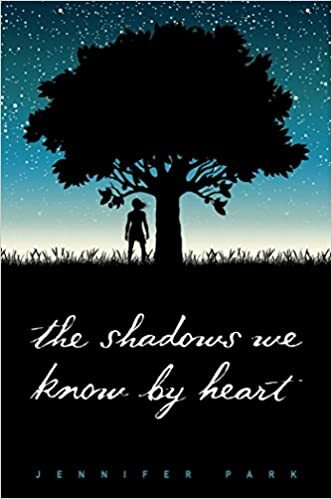 We are so thankful to Jennifer Park for pulling us out of the shadows and sharing more about her debut novel THE SHADOWS WE KNOW BY HEART. Jennifer, what was your inspiration for writing THE SHADOWS WE KNOW BY HEART? Probably my Mom. I’d gotten her hooked on the Finding Bigfoot show several years back, and she suddenly asked me one day if I’d considered writing a Bigfoot love story. You can imagine my reaction to that. But she kept bringing it up, and I finally started to toss the idea around. Setting it up as a Tarzan retelling really helped me find the heart of the story. It was when Leah finds reconciliation with her parents. I had wanted her to remain unforgiving and angry at them because of the lies they had all cultivated over the past ten years, because I was angry, but, as my wise editor insisted, we had to find some absolution for them. I really had to step out of Leah’s head to get it right, and look at the situation from her parents’ point of view. So while that one took the most work, it’s not the one I love. That honor goes to the campground scene, where you really get to see Bee as more of a person than an animal. There were so many fun moments to write, and I even tossed in a nod to Harry and the Hendersons. Shortly before I began drafting SHADOWS, I had just read Maggie Stiefvater’s SHIVER. It was one of those books that really resonated with me, kind of sucked me in and tossed me around emotionally, so I was still in that place when I began writing, and knew I wanted to create the kind of world that completely pulled you in and kept you there, broke your heart, and made you sorry when it ended. How long did you work on THE SHADOWS WE KNOW BY HEART? About four months start to finish. It’s by far the fastest book I’ve written. I chalk it up to desperation. Oh, this’ll be a fun one to answer… It’s a little ironic that this book is the one that sold first for me. I kept telling myself, if someone would just read it, just one agent, I think they’d see how unique it is, and not ridiculous as it might sound. And that’s exactly how it worked out. It took one agent who loved it, possibly more than me. And then a publisher who loved it as well. I still avoid telling people what my book is about face to face, who are not in the writing world. I’ll say YA fantasy, Tarzan retelling, whatever I can to avoid that word. I can’t count the times they’ve said, “like Twilight?” and I’ll say “YES! Like Twilight,” and end the conversation. Because when they push, and want to know more, the second I say it’s got Bigfoot, it’s either one of two things, they either seem excited, or their smile freezes and I know they just stopped taking me seriously. So then I immediately toss out my publisher’s name, as if I can somehow convince them that it is a real book, and someone actually wanted to publish it. So I’d say this book has taught me, or is still teaching me, maybe, to not be afraid of what people think about it, me, or any of my books. But I’m not capable of that, so then, hopefully, to care a little less about what they might think, and instead, to just stare at my book baby in its stunning cover and remind myself that I did this. What do you hope readers will take away from THE SHADOWS WE KNOW BY HEART? To remember for just a moment what it felt like to be sixteen or seventeen, and that first-love fire that we wish we could still hold onto. It took almost four years to get an agent, and SHADOWS was the fourth book I’d written. As I’d mentioned earlier, I was a little desperate by then. My third book was a middle grade fantasy which had done well in contests and got a lot of requests, but just not good enough to land an agent. When I sent SHADOWS out into the query trenches, I knew it was unique, but it also had Sasquatch attached to it, which I knew was not going to help. Out of the first forty or so I sent out, I only got one request, and my agent emailed back three days later for a phone call. It was so unbelievable, because I’d been stalking her on Twitter since she requested, as one does, and knew that she was reading something she loved. Suddenly her tweets were all caps and exclamation points, and she said she was emailing the author now. So I switched over to my email, sat there for ten seconds, and there it was. It was a beautiful two sentence email and I cried for nearly an hour before I could even answer her. As for the previous three, they’re all in various stages of revisions, now that I know what I’m doing… SHADOWS sold less than two weeks after I signed with my agent, so I really didn’t breathe much during that time. It was quite surreal. I had a few bumps in the road after that; my editor left, so that pushed me to the following debut year, and I had a hard time accomplishing much during the down time of waiting and not knowing what was going to happen. Twenty-three months from start to finish. But my new editor has been amazing, and I’m now a month away from publication! There are a lot of days I still wonder what the key is to writing a novel. I think there’s a lot of trial and error, tons of editing and rewriting, and plain mind-numbing hard work. I think the only moment I’ve had, that I can remember, was probably thinking that no one had written a Tarzan-retelling with Bigfoot, and that this would be the book that would make it. I usually listen to music, but it’s got to be something I’ve heard so much that I don’t really listen to it anymore. I’ve got a handful of songs I leave on repeat if I can’t concentrate or hit a roadblock. I always work at home because it’s got the least amount of distractions, but I can also multitask and do laundry or something during breaks. It’s hard to sit still and write all day. I don’t, actually, but I wish I could. I’ve got a good three hours in me and then I’ve got to do something else for a while before I can sit down again. Write and read as much as you can, whenever you can, because you will have no choice but to get better. Jennifer Park grew up on the bayous of southeast Texas. A former middle school art teacher, and current Ocean Artists Society member, she now lives tucked within the East Texas pines she loves, dreaming of the ocean and visiting every chance she gets. When she’s not writing or painting, she spends her time overloading on soy mochas, reading books, and managing her herd of one husband, two kids, numerous dogs, several voracious goldfish, a shamefully large number of garden snails, and one tortoise named Turquoise. Have you had a chance to read THE SHADOWS WE KNOW BY HEART yet? Do you sometimes feel ashamed to share your current idea with others? What are your tricks for getting around that? What is the most outlandish concept you have come up with? Share your thoughts about the interview in the comments!